Anyone who has ever watched Crufts will know that the Sunday evening programme would not be complete without a performance from Mary Ray and her ‘dancing dogs’. Today, Mary has announced that 2018 will be her final main arena appearance. Having started in agility and obedience in the 1980s, Mary Ray is credited with formally inventing the sport of heelwork to music in 1990. 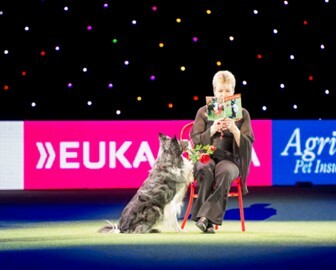 She first demonstrated a routine at Crufts in 1992, and has been a regular performer at the event since. Her routine is usually the penultimate event of the evening, and sets the scene for Best in Show each year. While Mary announced the retirement of her most famous dog, Levi, earlier this month, she has kept quiet about her own step back from the spotlight, though a blog post on 5 March implies that it was not her idea. The final performance will take place at 7:35pm in the Main Arena, and can be live streamed via the Crufts YouTube channel. You can read an interview with Mary Ray on the Crufts website. A full history of her routines and successes is available here.